CHAMPIONS #27 Written by Jim Zub Art by Max Dunbar, Nolan Woodard Published by Marvel Comics Release Date: December 12, 2018 THE CHAMPIONS IN WEIRDWORLD! The Master of the Weirdworld? The Champions’ mystic quest comes to an end – but at what cost? 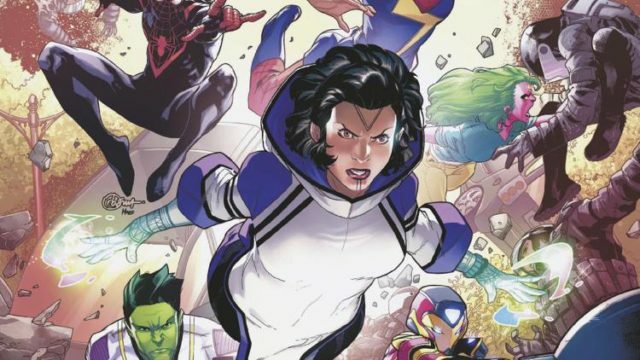 CHAMPIONS #24 Written by Jim Zub Art by Sean Izaakse, Marcio Menyz, Erick Arciniega, Clayton Cowles Edited by Alanna Smith, Tom Brevoort Published by Marvel Comics Release Date: September 12, 2018 THE CHAMPIONS GRAPPLE WITH A FOE THAT ALL THE SUPER-POWERS IN THE WORLD CANNOT VANQUISH!